Every cook worth his or her salt knows that precise measurement in the kitchen is critical. It can mean the difference between light, airy cake and tough, dense hockey pucks. The only way to be sure you've got the correct quantity of "ingredient X" is to weigh it. That's why you need this Digital Kitchen Scale! 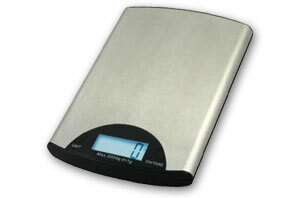 This digital kitchen scale features a low-profile design with stainless steel platform. It's compact so you can easily store it away when not in use. It's perfect for home baking and food portioning and great for home or office use. Best of all, this amazing digital kitchen scale turns almost any recipe into a one-bowl recipe!